No Shave November is a month-long journey. In this campaign people who take this oath, they forgo shaving and grooming in order to evoke conversation and raise cancer awareness. Learn more about how you can get involved and start getting hairy! The goal of this campaign is to grow awareness by embracing our hair, which many cancer patients lose, and letting it grow wild and free. Donate the money you typically spend on shaving and grooming to educate about cancer prevention and aid those fighting the battle. Participate by growing a beard, cultivating a mustache, letting those legs go natural and skipping that waxing appointment. Put down your razor and set up your own personal no shave November. The rules of this campaign are simple: put down your razor for 30 days and donate your monthly hair-maintenance expenses to the cause. Strict dress-code at work? Don’t worry about it! We encourage participation of any kind; grooming and trimming are perfectly acceptable. It does not mean that it is not useful for girls and women. 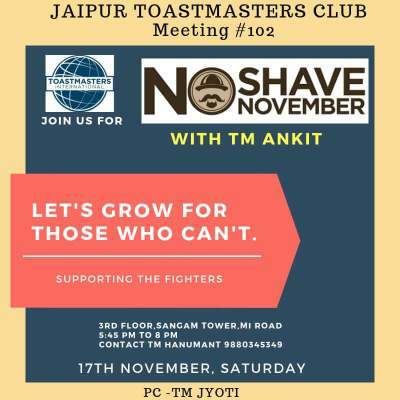 TMOD Ankit is coming up with his own narration and humor on the theme of No Shave November.